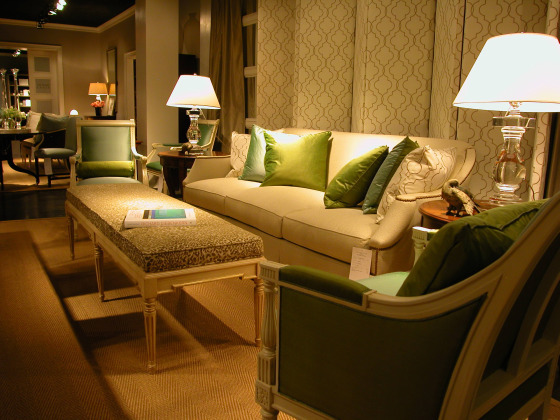 Warmth and welcome abound in this season’s Hickory Chair showroom! Here are some shots of the Spring market highlighted by beautiful Animal Prints. The Made-to- Measure Grant Ottoman by Alexa Hampton turned from traditional to a stylish transitional by wearing the playful hair-on hide Zebra! The Grant ottoman can be custom made from 18 to 60 inches square or rectangular and it features hand-turned mahogany legs that terminate in Antique Brass ferrules with casters. Distinctive nail head trim of your choice outlines this elegant piece. You can personalize it with many different finishes. 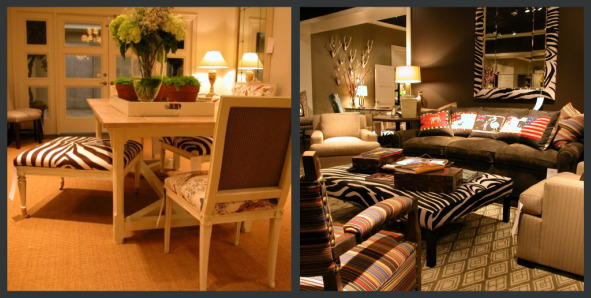 Another traditional/contemporary cocktail ottoman in Zebra by Thomas O’Brien brings emphasis and movement to any room. Relating to the Zane Chaise, the legs are crafted in wood with the same Georgian-style beading, yet the piece reads simplicity and clean lines. This warm and fresh living room by Suzanne Kasler is anchored by a tone-on-tone understated Leopard print rug in soft blue and neutral colors. 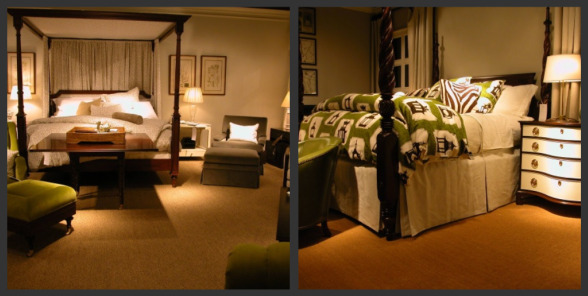 The traditional Planter’s bed by Mark Hampton and the Belle canopy bed by Alexa Hampton have been transformed into a relaxing oasis with Animal Print bedding and Bed accessories. Leopard print bedding and Zebra pillows give the purr…fect look! Here is another classic! The Cluny bench in Leopard print is a great accent piece for along the foot of a bed, a foyer beneath a grand staircase or even pulled up alongside a dining table. The upholstered seat, which stretches six feet from end to end, tops understated Directoire details like a squared apron and tapered legs. Available in many finishes. 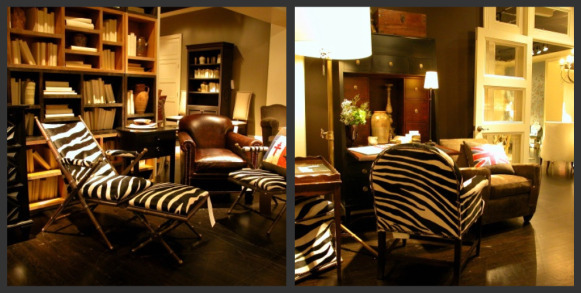 A few more Zebras: The Camp chair and ottoman with the amazing ergonomic comfort for casual lounging by James River and the versatile Oxford pull-up chair with a tight seat and back. Under the console table, the Charles hassock provides an extra seating in any occasion. The large Auburn Stool is inspired by a stool that Suzanne Kasler discovered at a Paris flea market. The original is from the 1940’s, with French Modern characteristics. Here with the classic Animal print is a definite winner. Available in many finishes. 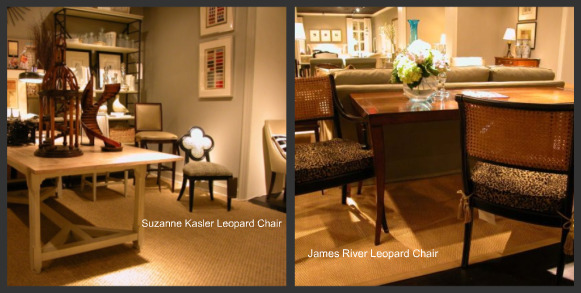 Occasional and dining chairs in the favorite neutral Leopard print make another strike in any room. I’m loving it! For more information on Hickory Chair products please contact us. Thank you for the wonderful showcase of Hickory Chair! Your eye for animal fabrics and hides is amazing! I think people identify with animal motifs as a natural connection. They ground us and make us feel connected with nature. It is a great way to bring the outdoors inside.